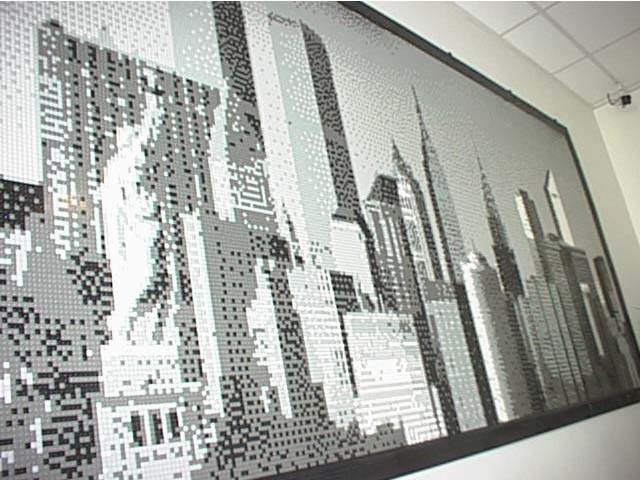 Here's a very sizable mosaic I just installed at the offices of LEGO Direct in New York City. 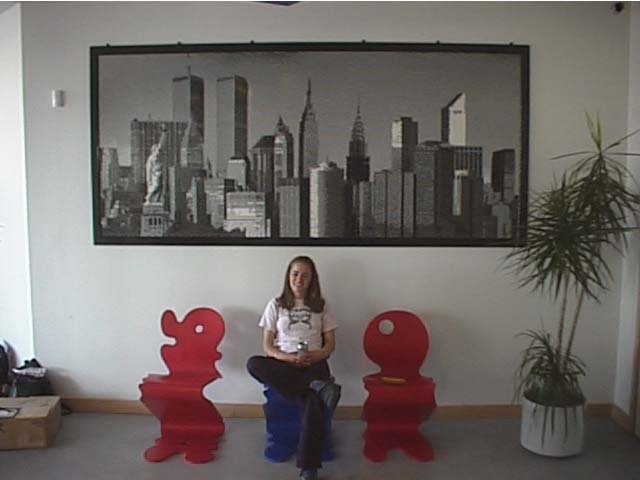 Earlier this year (2001) I discussed with LEGO the possibility of building a mosaic for their offices. 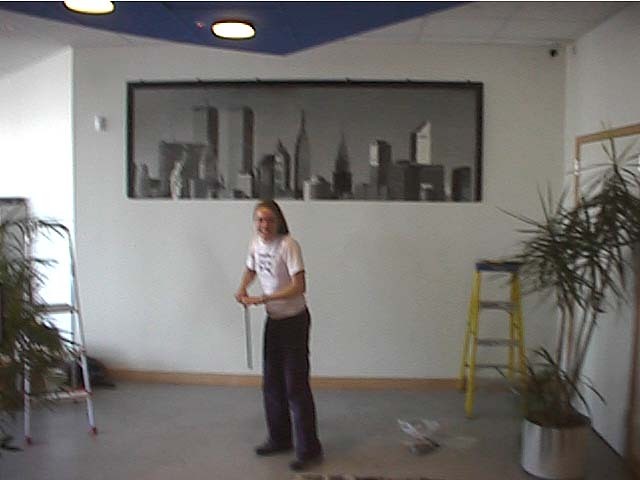 It was a quick decision to do a mural of the New York skyline. Which picture to actually use took a little longer to decide. 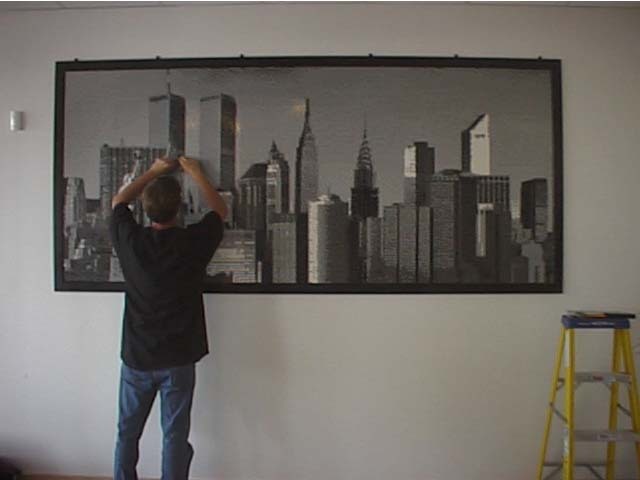 After a couple of weeks, one of the artists within LEGO created a 'composite' skyline of NYC. Anyone familiar with the skyline will immediately note that the mosaic version is not an exact image of reality. 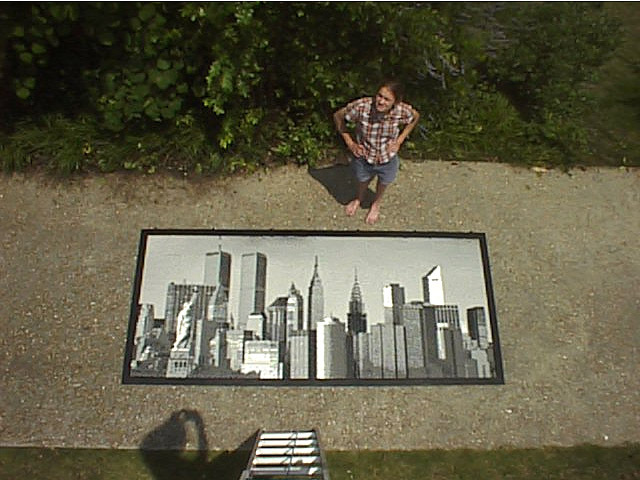 Buildings were shifted, and landmarks were moved so that as many recognizable items of New York could be squeezed into a mosaic which was to be 10 feet long and just over 4 feet high. 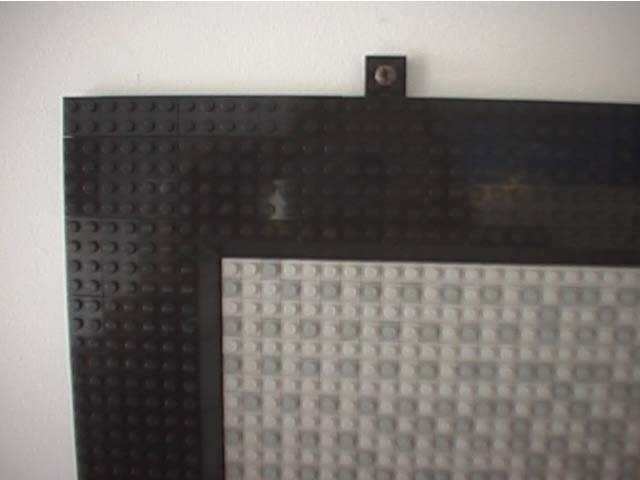 A grayscale image was used so that I could take advantage of the easy availability of white, black, and gray 1x1 plates which are used in the LEGO Mosaic kits. Of course, this mosaic is much larger than those created through the above program, so I used my proprietary application, Pixelego. Upon determining exactly how may baseplates, 1x1s, and border pieces would be needed, LEGO shipped approximately 60,000 pieces to me for this project. The phrase that was constantly going through my head as I clicked the little 1x1 plates into place was, "Physical Pixels, Physical Pixels..." Imagine trying to create an image in your favorite art application, but instead of handy shape tools, and image manipulation gadgets, consider if you had to explicitly click each pixel to its correct color with the mouse. You'll get a feel for how tedious this mosaic building seemed at times. To add to the labor, the 1x1 plates are packaged in bags of 90 pieces each. So the sixty thousand or so pieces were sent in about 600+ bags; each of which had to be opened. This may sound trivial, but it isn't... not after the first couple hundred (this was also compounded by the fact that additional pieces were sent to me so that I could construct a larger San Francisco mosaic... it alone takes another 120,000 pieces (and thus over 1000 more bags of 90)). It is at times like this when people tell me that I need to hire an assistant. It is in response to such suggestions that I can now say that I have hired an assistant; at least through mid-July or so. A friend of mine, Dorothy, has managed to keep her sanity despite opening, sorting, and disassembling some 250,000 or so bricks which needed such treatment in my studio. All of this in about two and a half weeks so far, and at this pace, she'll easily get through the remaining 100,000 or so that need attention. 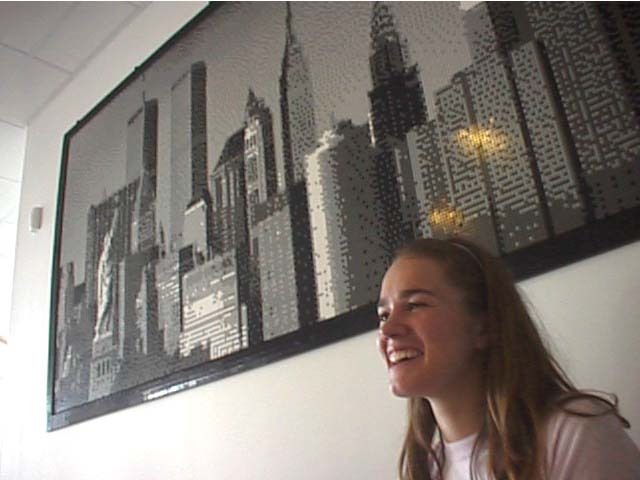 In addition to sorting Dorothy travelled to New York City with me to help install the mosaic in the LEGO offices. 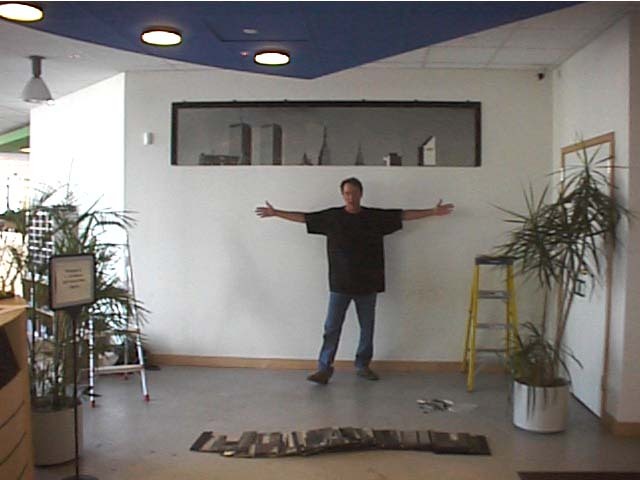 You see, the mosaic was, of course, built first at my studio in Alabama. Once completed, it was sectionalized according to its baseplate backing, and I managed to pack it into two relatively small boxes (small enough that Dorothy and I could each care one onto the airplane with no hassles from flight attendants). I expected the installation process to be nightmarish. I envisioned every possible disaster: airport security, having to check the boxes as luggage, lost boxes, lost pieces, forgotten pieces, forgotten hardware or tools (drill, anchor screws, level, tape measure, etc), mosaic baseplates falling off the wall once hung (keep in mind this whole this was being hung without any glue). The list of potential disasters was quite long. It was almost spooky how easily we got the mosaic installed. It took less than two and a half hours. 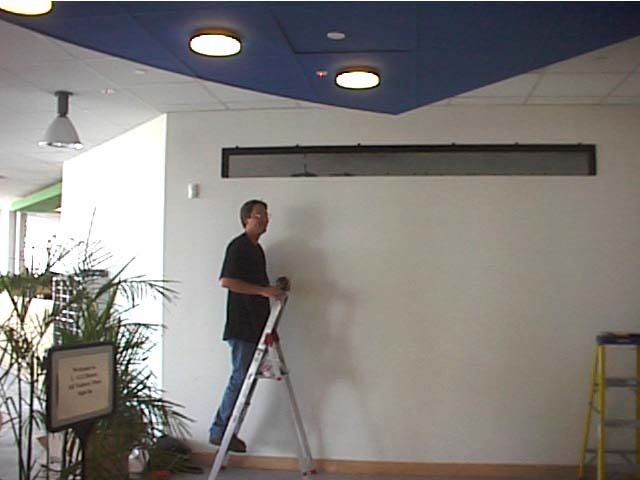 We started by hanging the top row of baseplates (technic plates with holes in them were used in conjunction with screws to fasten the mosaic to the wall along the top). Once the first row was complete, the remaining baseplates were simply held up in place as longer, non-1x1, plates were used to 'span' the seams between the baseplates and hold the whole thing together as one piece. In the end, the mosaic as a whole weighted about 50 pounds, and was 120 inches wide and 55 inches tall. Everyone seemed pleased with the result, so what could have been an experiment in LEGO tragedy turned out to be a wonderful experience for all. 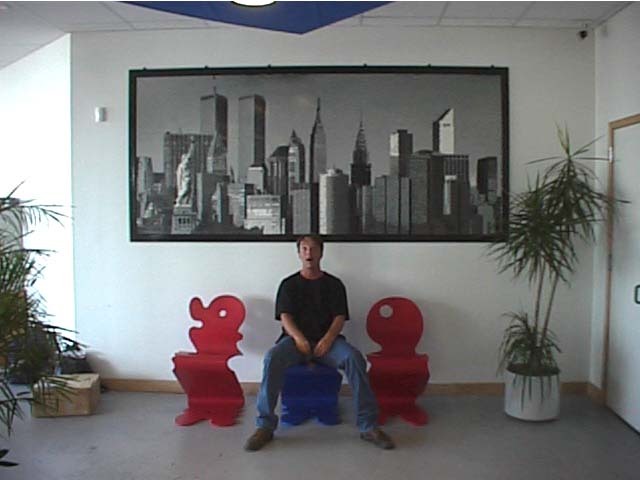 Thus, if you ever make it by the offices of LEGO Direct in New York, just as you enter the reception area of the LEGO area, look to the right... it'll be hard to miss my handiwork. My image comprised of Physical Pixels. 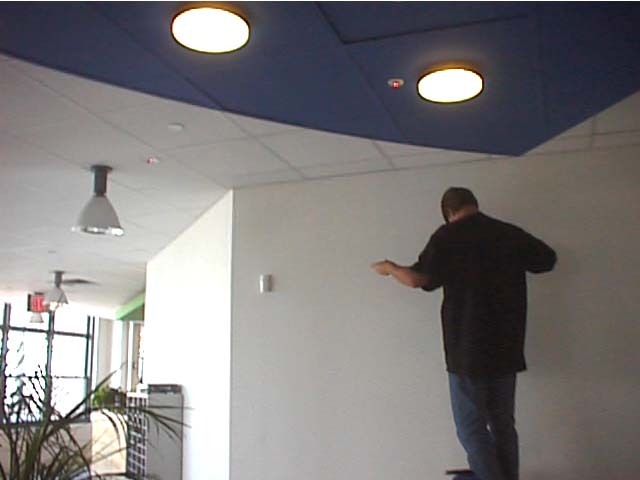 I begin by taking measurements and drawing level lines to locate the first hole to be drilled. Here I have finished the first row. Six technic plate hangers hold will hold the whole mosaic up. Row number two is completed. Dorothy is caught on camera as she is laying out baseplates in preparation of row #4 (sorry for the blurriness). With all the rows up, I start working in final spanning plates for strength. Dorothy kicks back after the installation is complete. My turn to sit in front of it. I 'signed' the mosaic along the border in my usual fashion, with raised bricks: "Harshbarger - June 2001". Dorothy places a few final pieces. A close-up shot of one of the hangers. A two-plate think technic hanger through which a screw is achored into the wall. Six such hangers support the whole mosaic... no glue is used. At close viewing, the individual plates are easily distinguished. As one gets farther away, or the angle of viewing gets sharper, the 'physical pixels' blend together and the image as a whole takes shape. This is a shot at my home in Alabama. I laid the mosaic out in my driveway and stood up on a ladder about 20 feet high (my shadow is in the lowerleft of the picture. Dorothy stands near for scale. I should thank the following people at LEGO for their help in making this project a reality: Brad Justus, Patrick Carroll, Claus Sennov, and Jessica Abramson. Thanks, guys, I hope you and the rest of the LEGO employees find the mosaic a wonderful addition to the office space.